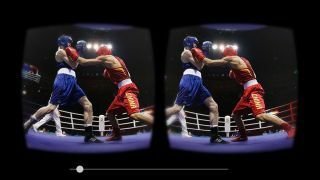 BBC Sport 360 app brings virtual reality to the 2016 Olympic Games | What Hi-Fi? The BBC Sport 360 app will mark the first time the Olympics can be watched in 360-degree virtual reality video. Events covered will include the opening and closing ceremonies, plus select athletics and boxing matches. The BBC Sport 360 app will get up and running on Friday 5th August, with the 2016 Rio Olympics opening ceremony, but you can grap the app now on Android, iOS and the Samsung Gear VR virtual reality headset. Live 360 degree footage will be available throughout the Games, with one event being broadcast each day. An estimated 100 hours will be shown and a choice of four different camera angles will be available for each event. 360 degree sport can be viewed using a phone and Samsung’s Gear VR headset or any low-cost mobile virtual reality headset such as Google Cardboard. If you don’t have either of those, don’t worry, the BBC has said the same content can be viewed on the BBC Taster website where you’ll be able to get a feel for that extra dimension by clicking and dragging your way around the screen. Justin Barritt, executive product manager of BBC Sport, says: “The BBC delivered the first truly digital Olympics for London 2012 and we’ve continued to develop and improve our digital service ever since. Now, we’re pushing the boundaries once again to bring people closer to the action than ever before. Not everyone can make it to Rio to cheer on Team GB so we’re looking forward to giving sports fans the next best thing." The 2016 Rio Olympics kicks off on Friday August 5th and the BBC will be broadcasting every event at the Games on TV, online and on mobile. Eager to get your Olympics fix? Read our complete guide to how to watch the Olympics.